I love a good steak, but there aren't all that many I go chasing after in Prague. Sure, I've had terrific steaks at La Casa Argentina, La Bodeguita del Medio, La Finestra in Cucina, and even Rocky O'Reilly's. But either the atmosphere, the service, or both at these places has put me off making regular visits. 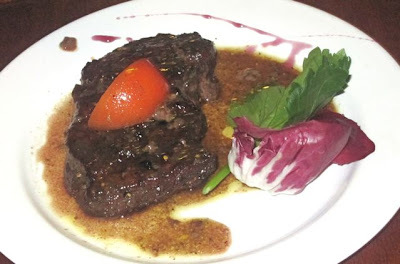 In recent years, we've most often gone for the rib eye at El Barrio de Angel. The service can be spotty, but it's not a bad looking spot in a big, brick-walled cellar. Plus, the smoky, tender beef was reasonably priced. To make it one of my favorites, the beef should be imported, preferably from South America. And it should have a good char on it, usually from a flame grill. I'd heard reports over the years that Crazy Cow Steakhouse near Old Town Square did great steaks. I finally got around to checking it out for myself. V and I trudged in on a snowy weekend afternoon. We sat in the small, brightly lit street-level dining area. 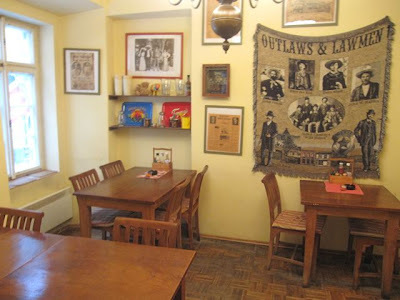 There's a hodgepodge of North and South Americana kitsch on the walls, but it was still lacking, atmosphere-wise. 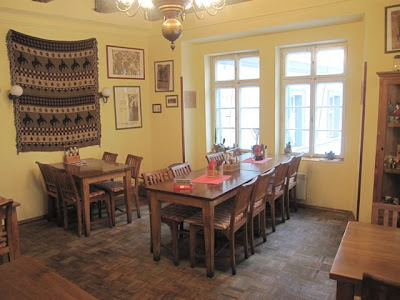 The restaurant has a bigger and more appealing dining room upstairs, but we didn't see that until later in the meal. I ordered a half-liter of Budvar (49 CZK). It tasted fine. 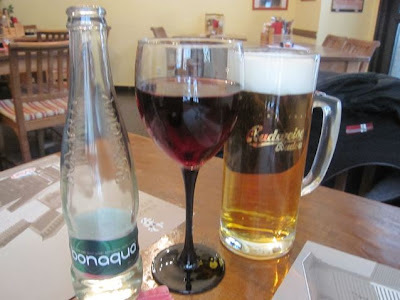 V had a .2 liter glass of Moravian red wine (50 CZK). They served Bonaqua sparkling water in a tiny .25 liter bottle with a big price (39 CZK). Aside from squeezing out extra profit, I've never understood why any restaurant would serve this boring stuff instead of Mattoni, which comes in .33 liter bottles. 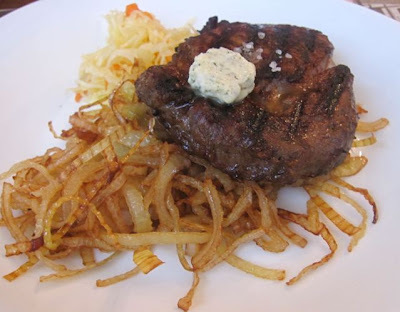 V got the 300 gram rib eye with fried onions (360 CZK). You should note that the on-line menu prices were not up to date as I write this. Side items were extra, but the onions with it were great -- sweet and crunchy. We didn't really care for the butter on top or the shredded, pickled cabbage on the side. However, the meat was the star. The delicious beef was tender, juicy, and smoky. It just needed an extra shot of salt, and then everything was right with this beef. V went so far as to say that she thought it was better than her favorite steak at El Barrio de Angel. I took a bite and thought they were at least equally good. They are close to the same price. I decided to try the Crazy Cow burger. It's normally 139 CZK, but it was just 99 CZK as a lunch special. This burger had potential, but they killed it. The quality of the meat itself was good. But it was salty, over-seasoned, and overcooked. 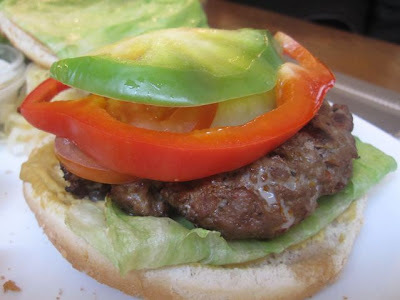 I don't like raw red and green peppers on my burgers, but those were easily removed. I'm not a big mustard on burgers fan, and unfortunately, that was not possible to take off. The top of the bun was soaked in a watery red sauce. The parts of the bread that weren't waterlogged were so dry that they cracked apart in my hands. 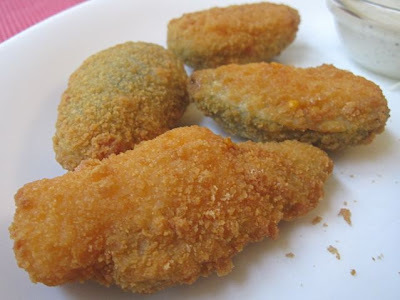 I wasn't in the mood for fries, so I ordered an appetizer of fried jalapenos filled with cheddar as a side dish. I was disappointed that I received only four of them for the price of 120 CZK. And these pickled peppers were surprisingly bland. They were not made in-house. I've seen freezer bags of identical fried peppers at Makro, and you can get a plate of four of the same at a restaurant across the street for 90 CZK. I decided to return a week later with my friend, Flash. We wanted to eat upstairs in the nicer room, but I was told it was completely booked for a party. 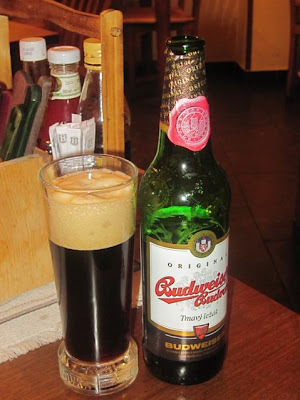 On this visit, I got a half-liter bottle of Budvar dark beer (49 CZK). I actually preferred its rich caramel flavor to the draft lager. 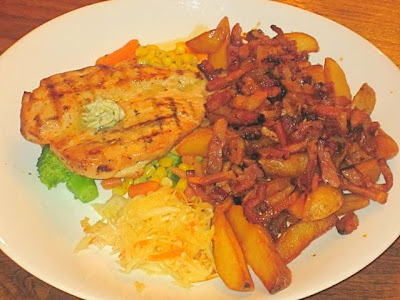 Flash got the Sante Fe chicken breast (165 CZK). On the side, he had the farmers potatoes, which were steak fries absolutely smothered in bacon, onion, and garlic (59 CZK). The problem here was that neither of us could figure out what made this chicken "Sante Fe." There wasn't much discernable seasoning. It did pick up some nice flavor from the grill. But unfortunately, the meat dried out on there. It came with vegetables like broccoli, corn, and carrots that looked like they came from a freezer bag. They did not complement the chicken in any way. 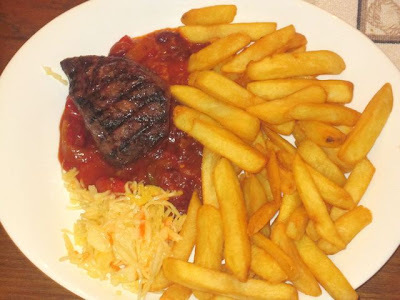 I ordered the 200 gram Desperado steak (229 CZK). The Argentinian beef rested on a tangy mix of red beans, garlic, onions, chili peppers, and ketchup. It may look quite small, but the meat was dense and rich. It was quite filling. This beef was not as tender as the rib eye, but it was well-seasoned, the flavor was all there, and it was perfectly cooked. The steak fries were hot and crunchy on the outside, while light and fluffy inside. They put a massive pile of them on the plate. I couldn't finish them all. During our beef-centered discussion, Flash told me that the steaks at Kozička down the street are excellent. I had a bite of a friend's later in the evening. It was juicy and peppery, but the chewy, overcooked meat didn't thrill me. I wouldn't rate it so highly. However, I can recommend Potrafena Husa's flank steak (247 CZK), which I had the other day. It is a new item on the menu at the Vinohradska restaurant. 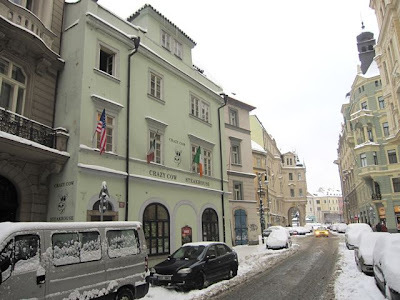 Getting back to Crazy Cow, the bill for the first visit was 767 CZK. The tab for the second trip was 600 CZK. For some reason, when the two Americans dined together, a stamp was added to the bottom of the receipt and a 10 percent service charge was added. This did not happen when one of the diners was Czech. My assessment: Crazy Cow Steakhouse serves great steaks at good prices. 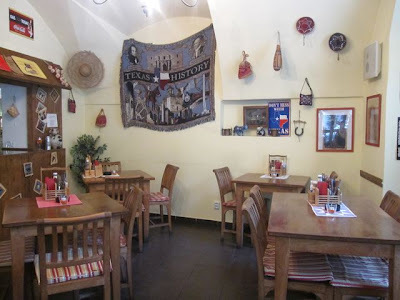 It's a decent option if you are in the tourist center and craving quality beef, fried potatoes, and a beer. If you want a second opinion, I'll tell you it's pretty ugly if you want something else. As I've already said elsewhere: The 10% service charge is illegal! According to the law, a menu has the same validity as a contract, that includes the prices. A restaurant can not add to the bill anything that the client has not ordered or that is not listed on the menu. By adding that 10% service charge (for which I'm sure they don't pay taxes), Crazy Cow was ripping you off. They don't do it to Czechs because they are not stupid. 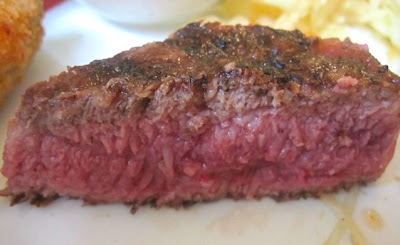 They may have the best steaks in the country, but Crazy Cow should be avoided at all costs. Thieves like these should be driven out of business. Indeed it is illegal, but I think the fine (if they ever get one) is too low to prevent this behaviour. and can decide for ourselves if we go to Crazy cows. Perhaps Brewsta can make another label on this blog and name the label 'the 10% chargers' or something like that. I just came across your blog and enjoyed it very much. I'm a banquet manager and write a blog about the daily aggravations that go with my job. Have a great day! I don't understand why some restaurants season their hamburgers. The best are just plain beef, no seasoning. That is what condiments are for!